is in #2. 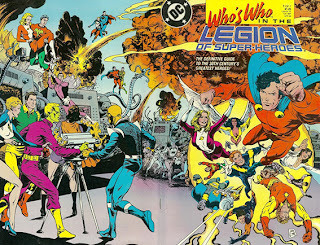 Character/artist listing: Absorbancy Boy by Curt Swan and George Perez; An Ryd by Curt Swan and George Perez; Animal Lad by Curt Swan and George Perez; Antenna Lad by Curt Swan and George Perez; Antonio Stefanacci by Curt Swan and George Perez; Arma Getten by Curt Swan and George Perez; Atmos by Greg LaRocque and Mike DeCarlo; Bacard Barley Circus by Joe Staton and Karl Kesel; Benn Pares by Joe Staton and Karl Kesel; Blackout Boy by Joe Staton and Karl Kesel; Blockade Boy by Joe Staton and Karl Kesel; Blok by Pat Broderick; Bouncing Boy by Ty Templeton; Brainiac 5 by Colleen Doran; Bounty by Colleen Doran; Calamity King by Dan Jurgens and Robert Campanella; Capt. Baktra by Dan Jurgens and Robert Campanella; Capt. Frake by Dan Jurgens and Robert Campanella; Chameleon Boy by Dave Cockrum; Chemical King by Valentino and Keith Wilson; Charma by Valentino and Keith Wilson; Chemoids by Ty Templeton; Circadia Senius by Ty Templeton; Colossal Boy by Dave Cockrum; Comet Queen by Keith Giffen and Grant Miehm; Command Kid by Valentino and Keith Wilson; Computo by Mike DeCarlo; Controllers by Mike DeCarlo; Cosmic Boy by Curt Swan and Grant Miehm; Crystal Kid by Jonathan Peterson and Keith Wilson; Dagon the Avenger by Jonathan Peterson and Arne Starr; Dark Circle by Jonathan Peterson and Keith Wilson; Darkseid by Keith Giffen and Grant Miehm; Dawnstar by Greg LaRocque and George Perez; Dev-Em by Rob Liefeld and Karl Kesel; Devil's Dozen: Evillo & Apollo & Hag & Sugyn & Wild Huntsman by Dan Jurgens and Robert Campanella, Dr. Zan Orbal by Jonathan Peterson and Karl Kesel; Diamondeth by Rick Stasi and Grant Miehm; Dr. Gym'll by Rick Stasi and Grant Miehm.